Koscuizsko Middle School teacher Therese Comor (center) appeared on ABC's "The View" as part of the show's "Hilarious Teacher" competition. 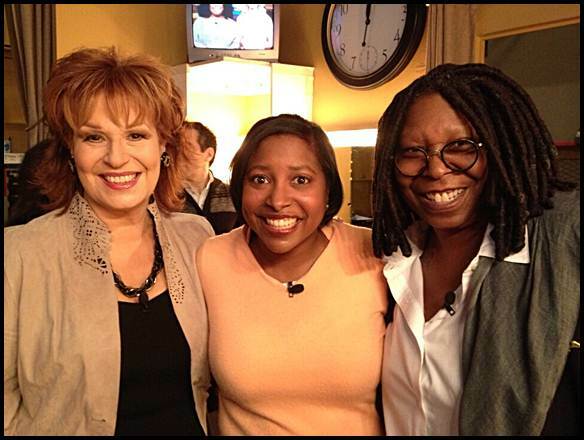 She earned rave reviews from hosts Joy Behar (left) and Whoopi Goldberg (right). Last Tuesday (Feb. 26) Koscuizsko Middle School teacher Therese Comor appeared on ABC’s “The View” as part of the show’s “Hilarious Teacher” competition. Although she didn’t win, she did a fantastic job and earned rave reviews from the hosts. Curious about what the experience was like, we caught up with Comor and got the low-down straight from the stand-up. I have been a teacher now for 15 years! Wow! Am I getting old? My first year teaching was in Georgia and then I moved back to Michigan and have been teaching here ever since. I currently am teaching Supplemental Reading classes for middle school students (7th and 8th graders). I became a teacher because I like helping kids. I like teaching reading because literacy is a vital skill that will last their entire life time. I often don’t see the results until years later when students come back to visit. That is one reason I really like Hamtramck — I am always running into former students. How long have you been performing stand-up? I have been a stand-up comedian since 2009. So about 4 years. I had just started working in Hamtramck and took a Stand-Up Comedy Class at Macomb Community College with Martin Arakelian. For graduation we got to perform at Mark Ridley’s. I just continued from there. I do perform regularly at Mark Ridley’s Comedy Castle in Royal Oak. Usually during Wednesday Open Mic Nights. I have also performed at Joey’s in Plymouth and at Gilda’s Laughfest in Grand Rapids. Are there any benefits to being both a comedian and a teacher? I think one benefit of being a comedian and teacher is that there are some times when I should be crying but I can laugh because I see the humor in the situation. Another reason middle school and comedy works is because there is not a tougher audience than a group of pre-teens and teenagers — sometimes I can test out material without them even knowing about it. I also do that with friends and family, too. Do you have any long-term plans for comedy? My future plans include a website that will include my blog and podcasts. I also would like to continue building my fan base by using Facebook and Twitter. I just really want to start marketing myself for appearances and shows. Given the opportunity, would you give up teaching for comedy? I think for me to give up teaching it has to be a position that will last a while and has good benefits. I would also need an opportunity that feeds my soul like teaching, so something working with people would be great. How did you come to appear on The View? I received a notification from a good friend that The View was looking for “Hilarious Teachers.” I emailed the link to my comedy DVD and they picked me (and four others) out of quite a few people. Did the show pay for your travel and accommodations? The show paid for my plane ticket and a nice boutique hotel around the corner from Times Square. They also had cars and drivers to get me around the city. I do have to say that the really modern shower faucet was way above my educational knowledge, so I accidently wet the entire bathroom before leaving for the show. I believe on a good day the studio holds around 240 people. That day it seemed like a full house. It was a lot different than working in the clubs. In a comedy club you can only see the first few tables around the stage. In a studio you can see almost everyone, even if it’s an outline. What was taping the show like? Were you nervous? They did let me rehearse in the studio first, but during the show I was nervous. Taping the show created some anxiety because it’s live — not a tape — and there are no “re-dos.” The studio was pretty large, and there are a lot of people that work there behind the scenes so the studio is pretty packed. I met two really great associate producers: Vinny Napolitano and Johnathan Faulhaber. They helped me work through the material and made sure I felt good about the day. I met lots of other producers but I can’t remember their names but they were all super nice. Did you meet any “famous” people? I walked past Brooke Shields. I also sat in the makeup room with Kate Gosselin. I got a chance to meet four of the regular hosts (Barbara Walters was sick). I also met the other judge Mario Cantone. He was hilarious — he called me prosciutto! When I got back to Detroit, I met the local ABC morning crew: Alicia Smith, Vic Faust, Erin Nicole and Keenan Smith. They were very kind as well. How have the kids reacted to your appearance on the show? Most of the kids have been congratulating me. They have been saying I did a good job, or I was funny, or they saw me. Most said I was funny. Some had no idea what had happened. Several keep asking me to tell them a joke. Even though it’s only been a few days, has anything changed for you since your appearance? I have had many people tell me that I have inspired them with my appearance. They are mostly women who said if I can do stand-up on national TV, anything is possible. Although I did not win The View’s “Hilarious Teachers” contest, I feel like I do have the tools to be a success in the entertainment industry. This experience gave me a taste of what is possible so now I have the drive to keep going. The minute the producers called me and said I didn’t win, I began thinking of Jennifer Hudson. She did not win her season of American Idol, but since then she’s won an Oscar and she’s living her dream. I think I can do the same. I can also show others that anything is possible. Therese Comor’s next show is on Wednesday, March 27 at 8 p.m. at Mark Ridley’s Comedy Castle in Royal Oak. For more information check out Therese Comor on Facebook (www.facebook.com/apluscomedy) or follow her on Twitter (@apluscomedy). You can also watch her appearance on The View at http://tinyurl.com/theviewcomor.